Shared taxis are called commonly Car Hire in Tunisia, a term more French! They can be found in bus stations, or if there is not a lease station. The car hire only part that when full (5 to 8 passengers). The roads are in good condition, but night driving is dangerous. We recommend the preferred taxi, which is relatively cheap and less risky. Especially outside of Tunis, it is better not to have an accident, if you will not have to pay too much for his pocket ... the driver is always wrong. We find the rental cars at airports and major bus stations in the country. To the south, the focus 4x4, roads are worse than the north and the less dense network. Roads are often tracks. Speed: 50 mph in city, 110 km / h on motorways, 90km / h elsewhere. Prices are a little more relevant are the train and bus are the preferred method of transportation of Tunisians. 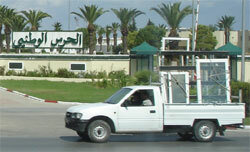 It connects the main city of Tunisia, through the Societe Nationale des Chemins de Fer Tunisians (SNCFT). Some domestic flights to Tunis Air and Tuninter practice, particular with regard to the binding Tunis - Djerba. Otherwise many flights with departures of France déservent most airports. Add to bookmark this page Tunisia " Moving to Tunisia " - Firefox do "Ctrl D"